The project is managed by Community Learning International (CLI), a US-registered NGO. Nongkiaw, a small town in Ngoi District, Laung Prabang Province, experienced virtually no tourism when CLI began working there. But the area has been discovered and tourism is rapidly increasing. Nongkiaw is situated on both sides of the beautiful Ou River, immediately surrounded by spectacular mountains. It is reached by the only road between Laung Prabang town and northeastern Laos and Hanoi, or by small boats that ply the Ou. Much of the population is ethnic minority. Tourists are drawn by the natural beauty, the slow pace of life, the lingering elements of genuine “Lao culture” and the low cost to stay a few days. The visibility of Laung Prabang town as an international tourism destination has led to spillover, as more adventurous tourists or those with more time venture further out into the province. Inevitably, the spillover has reached Nongkiaw and is growing rapidly. 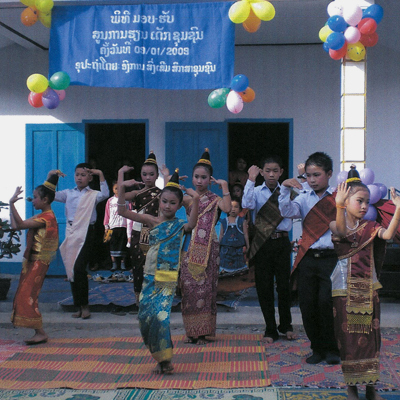 Young Cultural Ambassadors Project (YCAP) is aimed to provide opportunities for local young people to have skills training and participate in tourism-related cultural education activities, as well as increase tourists’ understanding of, and respect for, the culture of a small Laotian community. For tourist, the project will help them understand and enjoy the experience of Nongkiaw more completely. The performance, book and video will highlight the traditional and comtemporary, the formal and informal culture, the social do’s and don’t, the need to respect and preserve the natural environment that the community depends on for survival, and how to access opportunities to experience Nongkiaw in greater depth and to contribute via volunteering.